Hollis McCarthy and Jackie Hansen in Shatter. Photo by Carol Rosegg. BOTTOM LINE: This historical drama tackles the tragic Halifax Explosion of 1917, but ends up more like a soap opera as it plunges from one tragic scene to the next. A warship that blew up in Halifax Harbor in 1917 was the largest man-made explosion in the pre a-bomb world. After colliding with another ship, the Mont Blanc caught fire and, minutes later, exploded into a blast that killed 2,000, injured 9,000 and left a peaceful city situated an ocean away from the war raging in Europe, in absolute shambles. Shatter, a play by Canadian playwright Trina Davies which has its American debut this month at Urban Stages, explores the lives of four fictional residents of Halifax before and after the massive explosion destroys their city. Jennie MacLean (Hollis McCarthy) and her daughter Anna (Jackie Hansen) are a couple of run-of-the-mill Haligonians (apparently that’s the word for a person from Halifax) and Elsie Schultz (Rebecca Nelson) is a widowed German immigrant and Jennie’s best friend. Before the explosion, their lives are peaceful and serene: Anna writes in her diary about Brian (Michael Chris McGuire), a handsome soldier she sees around, Elsie visits Jennie for teatime and, although there is a war out there in the world, it seems to only be boosting things in Halifax. Then the explosion changes everything and Shatter particularly focuses on the finger-pointing that emerges in the aftermath, how the blame falls on the Germans, and how Anna and Jennie’s close friendship with the benign Elsie erodes under the influence of social pressure, which is embodied by Brian’s character. The truth behind the events of Shatter gives it gravity, but the way the story unfolds has a soap opera-like quality to it that made it difficult for me to feel emotionally engaged. The plot turns line up so cleanly that they feel unnatural. The little clues that push the characters forward in their thinking are so numerous and readily available, that their world loses its glimmer of a grim reality. The characters make choices that don’t really seem logical, but instead seem necessitated by playwright’s desire to manifest the next scene. True, the drama in Halifax just after the explosion must have more thick and suffocating than we can imagine, but the world of this play seems to suffer from the multitude of tragedies woven into its fabric: rather than letting us sit with the most important plot lines, all the little instances of death and sorrow seem to outpace the play's emotional impact. Perhaps Shatter could deliver a more emotional punch if it slowed down a bit and been more character-driven than plot-driven. Still, the cast does decent work with the material. 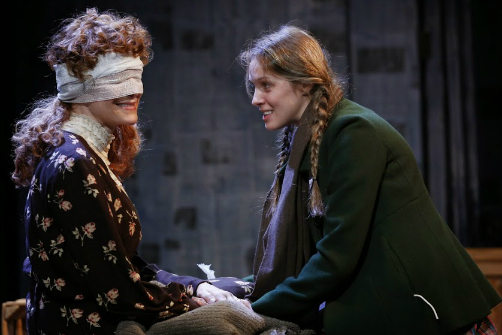 McCarthy has moments as Jennie, who was blinded by the blast and wears a bandage over her eyes, where she nearly explodes under the weight of grief and anger. Nelson is also great as Elsie, trying to stay calm while she transforms into a source of blame, bringing a deeper sense of humanity to her character than the others (and her German accent is more natural and less distracting than the Canadian accents around her). The story told by Shatter is undoubtedly tragic and the Halifax Explosion of 1917 is certainly a tough story to tackle. Imagine, for instance, a play attempting to tell a story set at the World Trade Center on or shortly after 9/11; I think it would be difficult to strike a balance between a realistic representation of such an unknowable tragedy and good on-stage story telling. Shatter seems to wrestle with that balance and, ultimately, can’t quite win.